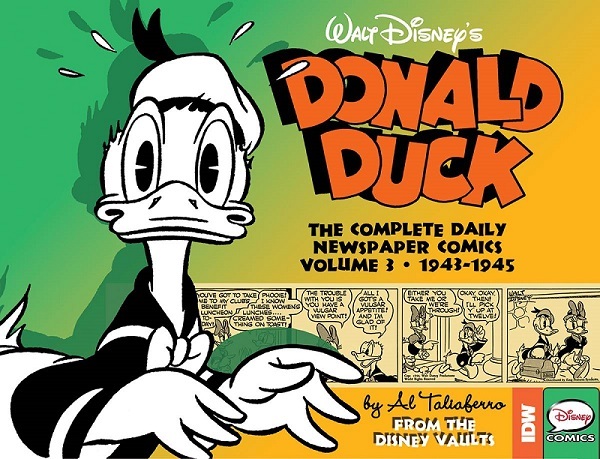 In a comment on another post there was a question about a Taliaferro strip described as "In a 1940s Donald Duck newspaper strip, Donald applies for child benefit as the sole guardian of Huey, Dewey, and Louie". It turns out the strip in question was the August 21, 1944 Donald Duck daily strip. So this post is by request, just showing the newspaper strip. So, it sounds more like a matter of tax fraud. Donald doesn’t apply for child benefit in the strip. This strip will be published in volume 3 of IDW’s Donald Duck daily strip collection, coming this summer. This is a series I highly recommend for anyone interested in Al Taliaferro’s work or early Disney comics history. Especially interesting in the last volume and the upcoming one is seeing how wartime in USA influenced the daily comic strips. And Donald is prepared for anything, getting a bomb shelter in his garden! Thank you for writing this blog entry based on my off-topic post about this strip. I don't know much about what a "child benefit" or similar things are; plus, I only used this expression when quoting the description from TV Tropes, written by a Finnish user, and we don't know how the strip was translated in Finland. Anyway, it seems to me that the main pont of Donald's tax fraud is that the more children you are the legal guardian of, the less tax you must pay, and that's why Donald pretends to be the guardian of 10 boys instead of 3. Anyway, Donald's nephews are listed as dependents, thus making explicit what was already implicit, i.e. 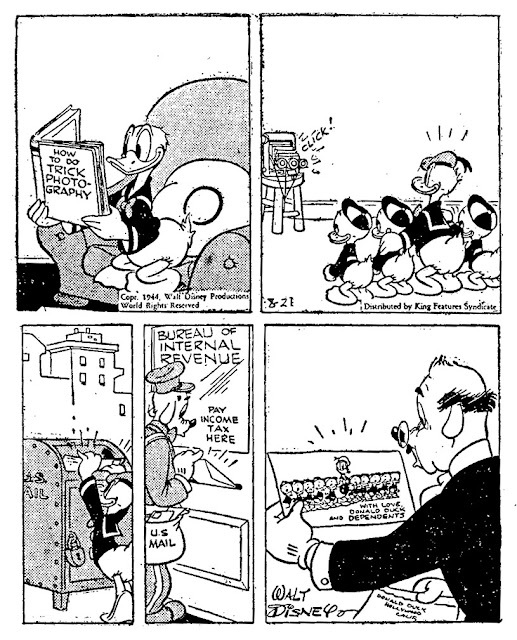 Donald adopted the boys (which was already stated two years before in the short "The New Spirit"). I am curious to know where did you find the strip. It's in black and white so it can't be from WDC&S #114: do you have the original 1944 newspaper? ""Donald Duck Hollywood" + something I can’t read (envelope)": I guess it's "CALIF.", meaning California. It makes sense, as Hollywood is in California; plus, it is coherent with what was shown in the Sunday page of October 17, 1937 (the one that introduced Huey, Dewey and Louie), where in the envelope of Donald's letter we read "Donald Duck, Hollywood, Calif." Too bad there are two different collections for the daily strips and the Sunday pages, I think a single collection with both daily strips and Sunday pages in chronological order would have been better. Anyway, if you don't mind a suggestion for a future blog entry, I think it would be interesting to do a list of places mentioned in the newspaper comics as the location or possible location of Donald Duck. Are there more mentions of "Hollywood, Calif." beside the two examples I cited? And how many fictional cities are mentioned? I only know of Hickville (daily strip of March 8, 1938), Homeville (daly strip of September 3, 1938) and Centerville (daily strip of March 17, 1939); there are probably more examples, but I have access to a limited amount of strips. Yep, "CALIF" is probably it. This one I got from another source though. But old newspaper strips are not too hard to find in online newspaper archives. You can find this strip in ex. "I actually have a box filled with newspaper clippings of Disney daily strips and sunday pages": I see. "But I've never done any serious collecting of those, so what I have is pretty random and they are not properly sorted or cataloged (..soo much work)": I guess your collection won't be random anymore now that IDW is reprinting these strips. "This one I got from another source though": it shows, as both images you linked have a bad quality in the last panel, while the image you posted is in good quality. "But old newspaper strips are not too hard to find in online newspaper archives": thanks for the suggestion, it didn't occur to me that I could find the strips in the online newspaper archives; I will make use of this suggestion if I have to do more researches in the future. Anyway, now I know that these newspaper comics were printed in several newspapers.